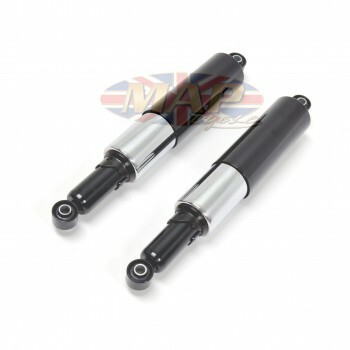 A very nice replica of the shocks used on Norton ES2 and Model 50. 13" (330mm) eye to eye. Fully shrouded shock with gloss black top, chrome middle and gloss black bottom. A reasonably priced alternative to Hagon shocks. Adjustable with three pre-load settings. Hard rubber mounted eyelets are 10mm in diameter. Have a Question about Norton ES2 Model 50 Replica Universal Rear Shock Set ?